A story about Liverpool fan Lenny Woods’ impending latest trip of many to Wembley to watch his club Liverpool prompted a lively Twitter debate about whether his 33 trips there to watch his club was a record. Liverpool have in fact played 31 ‘competitive’ games there: 13 Charity Shields (or equivalent), 10 FA Cup finals, 7 League Cup finals and the 1978 European Cup final, as well as two matches in the Makita International Tournament of 1989, plus one match (not a proper match, abbreviated to 40 minutes) in the 1988 Football League Centenary Tournament. Have won three of their seven League Cups there (winning two others in replays held elsewhere, and two in Cardiff). They also lost League Cup finals at Wembley in 1978 and 1987, and drew two League Cup finals at Wembley, in 1981 and 1984. Have won five of their 10 FA Cup finals there (losing five there, while winning two others FA Cup finals in Cardiff). Won the 1978 European Cup there. So in Wembley finals to date, Liverpool’s win record is nine from 18, or 50 per cent, ahead of their 2012 Carling Cup final against Cardiff. According to Glen Isherwood’s definitive history of Wembley Stadium (up to the end of 2000), Arsenal had played most matches there until that point (41), with Liverpool and Manchester United next best on 33 each. Since 2000, Arsenal have been back only twice (in an FA Cup semi-final and a League Cup final), for 43 Wembley appearances in total, while Liverpool have not been back, and Manchester United have been back a further 12 times (one FA Cup final, two League Cup finals, five Community Shields, one European Cup final and three FA Cup semi-finals) for a record club total now of 45 Wembley appearances. This prompted the question: which club has won the most trophies, not just at Wembley but altogether? Sportingintelligence looked at how many times each English team has won the league title, the FA Cup, League Cup or any other the ‘main’ European trophies: European Cup, Uefa Cup, Cup-Winners’ Cup or Fairs Cup. ‘One-off’ events such as the Charity Shield and Super Cup are not included as they are not tournaments / competitions, per se. The results of that research are in the table below. Liverpool have won most trophies, 40 of them, followed by United on 38, then Arsenal (27) and Aston Villa (20). Not all trophies are worth the same, of course, so we have also attributed a points value to each trophy to see if ‘weighting’ makes a difference to the rankings. (Every club who has won the English title at least once since 1889 is included in the full table). The points system is of course up for debate, but 10 points for a league title and the equivalent for Europe’s biggest prize seemed reasonable. An FA Cup win is worth 5.5 points on the basis it’s a big prize but only a bit more than half as prestigious as the title; while 4.5 points are given for a League Cup win and 6.5 points for any other other main European titles. On the basis of points not trophies, the top four stay the same anyway, with the rest of the top 10, in order: Everton, Chelsea, Tottenham, Sunderland, Newcastle, Blackburn. Liverpool and Manchester United are clearly England’s all-time most successful pair of clubs. With the FA Cup and League Cup still to play for, Liverpool could extend their trophy haul to 42 in total this season, or flop and stay on 40, or win one and get to 41. United could still win the title and the Europa League for 40 titles in total, or win neither and stay on 38, or win one and reach 39. If all-time dominance in English football were measured at the break for the First World War, Aston Villa would have been kings, with six titles and five FA Cups by then. In the inter-war period, Arsenal staked their claim. 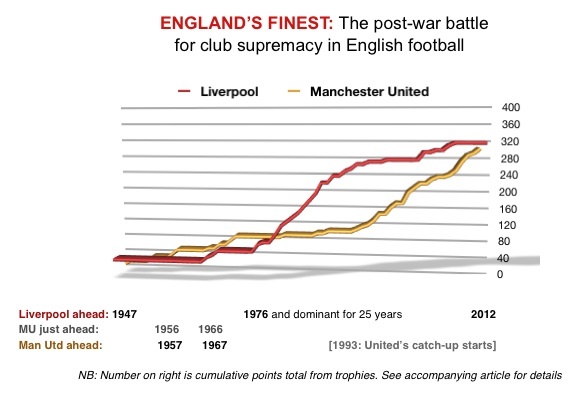 But in the post-war years, Liverpool and then Manchester United and then Liverpool (with Manchester United chasing hard and fast) have held sway. A graph depicting their battle is below.